The Israeli authorities have consistently, systematically and deliberately pursued serious escalation policies and illegal practices that constitute human rights violations against Palestinians in occupied Jerusalem. Such policies were further emboldened by US President Donald Trump's relocation of the US Embassy to Jerusalem in late 2017 as the undivided capital of the State of Israel. This move effectively gave Israel a green light to continue and escalate its blatant violations against the Palestinians, especially in occupied Jerusalem, in an attempt to illegally remove the Arab, Islamic and Christian identities of the Holy City. As the escalating campaign continues, Israeli authorities in February have further entrenched their racist policies against Jerusalem’s Palestinians. Cases of arbitrary arrests, home raids and searches, intimidation and illegal detention by Israeli forces have been recorded and documented in the following report. Other impediments and restrictions on Palestinians’ public freedom have been recorded as well, including by preventing them by all means from carrying out social and political activities under vague pretexts with the end goal of erasing the Palestinian identity. 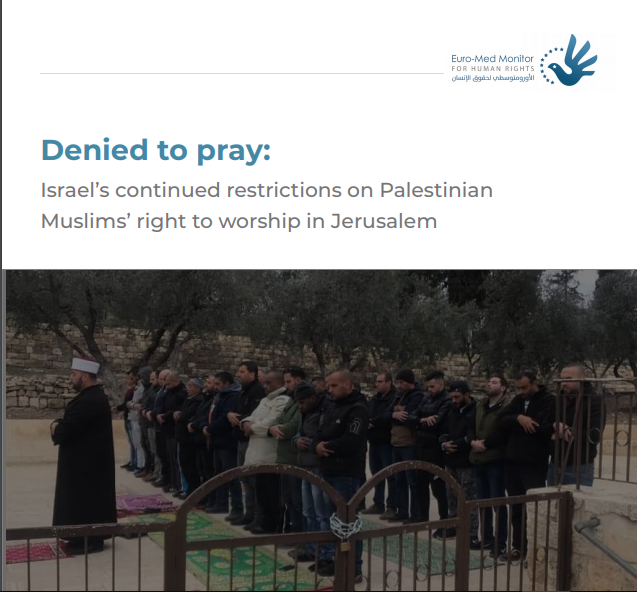 In this report, the Euro-Mediterranean Human Rights Monitor focuses on religious violations against Palestinians in Jerusalem, attacks on worshipers and restrictions on their religious freedoms, in a stark violation of international laws.